Contact us today! Cheap rentals go fast! $580 building fee included! Do you want a view of the river! Three bedroom 3-bath luxury apartment overlooking the Yununcay River with balcony! This is a luxurious building that is extremely peaceful and a hop skip and a jump from Solano Avenue and Tres Puentes. Absolutely gorgeous view with balcony three bedroom three bath, balcony with view of the river. Elevator and 24 security service. No pets please. The price includes the building fees. 1 your contract please. Green Space Alert! Villa in Las pencas! $500 three bedroom unfurnished three bath BBQ patio garage and close to everything! You guys wanting GREEN SPACE for cheap??? This is a nice little gem in Tejar 3 bedroom 4 bathroom for only $390!!! It has parking space for 2 cars, a chimney, yard, a massive kitchen, more than 2100 square feet! Pets allowed, one year contract please! Furnished 2-bedroom 2-bath on Ordonez lasso $500 with access to a swimming pool and a turkish sauna. Building fees included! Are you needing something furnished, with great views, and with access to a swimming pool, tennis court, and above all things a Turkish sauna and balcony! Well you will love this cute two-bedroom unit with 24-hour security on Ordonez lasso. You have included both parking space and storage. No pets please. El Vergel three bedroom three bath $575 including building fees with balcony and some lovely views. Awesome beautiful gem of an apartment close to everything! Located in an exclusive neighborhood right across the street from El Centro. Unfurnished. Accepts pets with 2 month guarantee. Rent includes building fees. Green Space! $300 2 bedroom 2 bath Cottage near 27th de febrero! Small pets allowed! Everybody in there dog wants green space, as a matter of fact everybody wants green space for their dog! I've got a gem here that a lot of you folks will be interested with. This is a cute little Cottage near Gapel that is unf3urnished, and allows pets. 15 month contract please. You will be… Continue reading Green Space! $300 2 bedroom 2 bath Cottage near 27th de febrero! Small pets allowed! $700 with beautiful views and balcony across the river. Fully furnished and includes all utilities and internet! So if you're wanting something completely inclusive, with views and balcony and beautiful designer furniture, give me a call today! This is a beautiful 3 bedroom 2 bath swanky little pad with an awesome landlady! It has a storage room and two parking lots, as well as many amenities. Close to supermaxi and the tranvia… Continue reading $700 with beautiful views and balcony across the river. Fully furnished and includes all utilities and internet! You want to be in Centro with cheap but awesome views on the West End of El Centro? $450 with building fees included balcony and Vistas Galore! Las Américas apartment 3 bedrooms 2 bathrooms, storage room. Excellent neighborhood and incredible views of the city from your balcony! Close to both Centro and supermaxi. Small pets accepted. One-year contract please. Enter your email address to follow this blog and receive notifications of cheap new rentals by email. 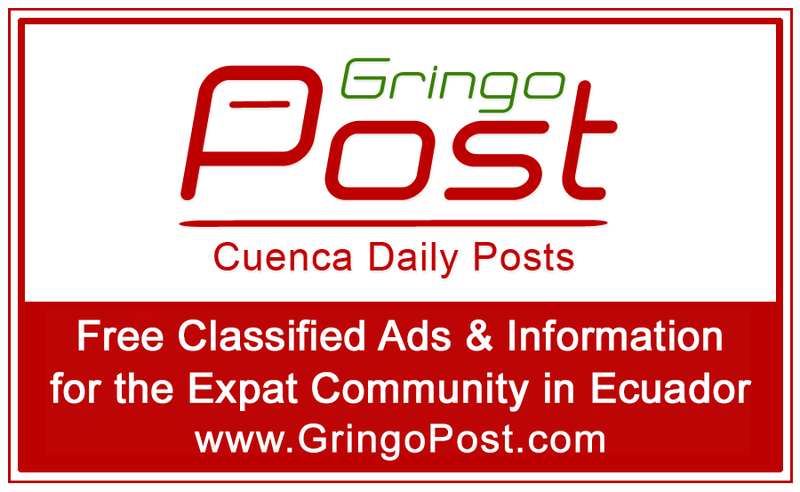 VISIT THE AMAZING GRINGO POST!